I spent the early part of this week in Kansas City, and after hours had some free time to shoot around the downtown area quite a bit. It's really nice. I hadn't been to KC in many years, and never with a camera. 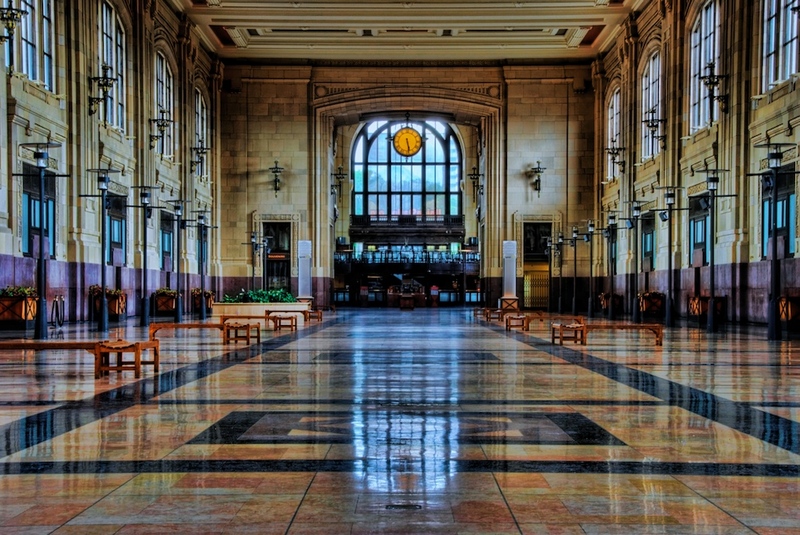 One of the first places I went off to explore was their Union Station, an updated and renovated train station downtown. It's fabulous. I love places like this. Since it was about 6pm, there weren't very many folks inside, which is good for me. I only had to wait for the occasional person that was wandering around to wander back out of my way. I spent a lot of time in and around Union Station, shooting architectural shots like this, as well as checking out some of the trains out back. It was awesome and I am looking forward to processing some more shots! I took about 400 shots in KC! In this shot, I really like the orange glow of the large clock in the distance. This is a 7 exposure HDR taken at f/14, with exposures ranging from -4 to +2. They were merged in Photomatix to create the HDR file, and then I made some adjustments in PSE, Topaz Adjust, and Aperture. Topaz Adjust allowed me to bring out some of the details and textures that you see here. Enjoy! Look for more KC shots coming soon!